Pegasus is the creator of the Duel Monsters card game. He gained the idea for the card game from ancient “games of darkness” (English: Shadow Games) that were played in ancient Egypt. 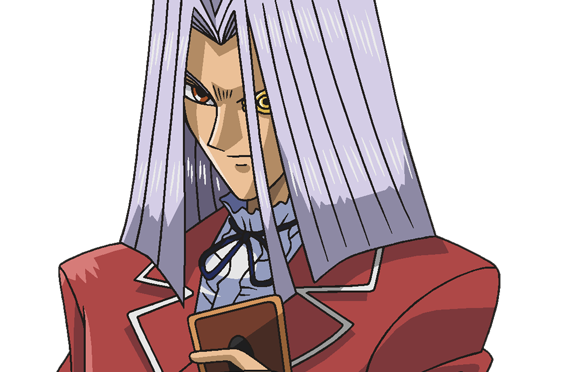 Pegasus owns the Industrial Illusions Company that manufactures the Duel Monsters cards. He also wields a Millennium item, the Millennium Eye, which gives him the power to see in other people’s minds as well as an opponent’s hand during a duel. With this distinct advantage, he defeats several major duelists in the span of the Duelist Kingdom Story Arc. Once Pegasus hears about how Yami Yugi defeated Seto Kaiba, the uncontested world champion in Duel Monsters, he assumes Yugi has a Millennium item, and decides to go after him. Within a videotape containing Yugi’s dueling glove and two starchips, he forces Yugi into a Game of Darkness (English: Shadow Game). At first, Pegasus takes the early advantage, and burning time by explaining to Yugi the origin of the Millennium Items and the Shadow Games. Yugi realizes that Pegasus can see the cards in his hand because he can read the minds of others via the Millennium Eye. It is then that Yugi starts playing cards straight from the deck and makes a comeback with the Black Magician (English name: Dark Magician). Pegasus, somehow, takes control of the Black Magician (Eng Name: Dark Magician) with his No-Faced Illusionist. Yami Yugi, notices that this has left Pegasus wide open to a physical assault, in which Yugi summons the Demon Summon (English name: Summoned Skull). Since the duel had a time limit, unfortunately, before Summoned Skull connected with its attack, the timer ran out, leaving Pegasus with more life points, and giving Pegasus the right to inflict a “Game Penalty” on Yugi. Pegasus took Sugoroku’s soul (Yugi’s grandfather), which forces Yugi to go to the Duelist Kingdom tournament. Pegasus does a lot of scheming during his story arc. The “Big 5”, otherwise known as KaibaCorp’s executives, struck a deal with Pegasus, that if he defeated Yugi in a duel, disposed of Seto Kaiba, and captured Mokuba, he would have control of KaibaCorp’s virtual technology. With Yugi already at Duelist Kingdom, he sets up many different obstacles for Yugi to overcome. Of course, Yugi does manage to enter the castle only to see Seto Kaiba already dueling Pegasus. Pegasus soundly defeats Kaiba with Toon World, and using Kaiba’s own Deck Destruction Virus of Death (English name: Crush Card Virus) against him. Once Yugi defeated Mai and Jounouchi to duel Pegasus, the final duel of the Duelist Kingdom tournament was underway. First, Pegasus strikes a deal with Yugi. If Yugi would happen to win, Yugi would gain Pegasus’ sixty percent share of his Industrial Illusions company. If Yugi were to lose, his soul would be entrapped in a card, just like Seto Kaiba, Mokuba, and Sugoroku. As the duel starts, Pegasus is basically laying the smack down on Yugi via his Millennium Eye. Pegasus then turns Yugi’s Demon Summon (English: Summoned Skull) into Toon Demon (English name: Unknown) by taking control of it and playing Toon World. As the duel goes on, Yugi realizes that there is a little “lag time” for Pegasus to read someone’s mind. This causes Yami Yugi and normal Yugi to start shuffling forms because Pegasus can’t read the non-active Yugi (e.g. If Yami Yugi is presently dueling, normal Yugi is not, so Pegasus can’t read normal Yugi’s mind. Then to play the card, Yami and normal switch). Yugi starts making a comeback with the Black Magician and the Magical Silk Hats magic card. Yugi destroys the toons by destroying Toon World. As this happens, a Game of Darkness (Eng: Shadow game) setting starts to appear. Pegasus counters Yugi with a ritual monster, Sacrifice. Pegasus fuses Sacrifice with the Wicked Lord of a Thousand Eyes, which has the ability to absorb Yugi’s monsters. Yugi finally ends the duel with the Magician of Black Chaos. After this whole ordeal had been finished Pegasus restored all that he had taken. Unfortunately, for Pegasus, since his shadow powers had been used up dueling Yugi, Bakura went in and proceeded to “take” Pegasus’ Millennium Eye. Pegasus has not been seen in the Yu-Gi-Oh! Series ever since. Pegasus’ real intentions were found in his diary after the crew found it. While Pegasus was gone, Anzu (English name: Tea), read his diary. He wanted KaibaCorp’s virtual technology to make his long lost love Cyndia alive through a card. Cyndia was supposed to be Pegasus’ wife, but she died before they could get married. Pegasus, then, went to Egypt where he had heard about the Millennium items. He encounted Shadi, who forcefully “gave” him the Millennium Eye. Shadi wields the Millennium Ahnk. Pegasus’ deck is mainly a Toon/Thousand Eyes Sacrifice deck. He plays the most of his monsters with the magic card Toon World, which allows his monsters to attack directly. After that, his backup strategy is using cards like Thousand Eyes Sacrifice to absorb his opponent’s big hitters and attack with them.